Do you love Chili’s? 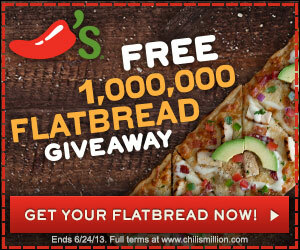 Have you claimed your coupon for a free flat bread? Right now when you join their email list, you can get a coupon for a free flat bread. I don’t know about you but free always sounds good to me! Grab your coupon by clicking on the banner above!